The height of Mount Everest is 8848 metres (29,029 ft). Mount Everest is located in the Himalyas on the Nepal - China border. 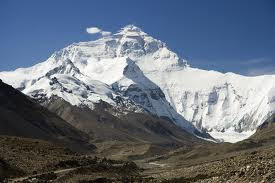 Tibetan name for Mount Everest is Chomolungma or Qomolangma. Mount Everest is called Sagarmatha in Nepal which means goddess of the sky. Mount Everest was first successfully ascended by Sir Edmund Hillary and Tenzing Norgay on May 29, 1953. He was conferred honorary citizen of Nepal on the 50th anniversary in 2003. Jordan Romero became the youngest person to climb Mount Everest in May 2010. He was 13 years old. Oldest climber to reach the summit is 76-year-old Min Bahadur Sherchan. There are 18 different climbing routes on Everest. It takes 2 months to climb Mt. Everest in order for the body to adjust to the high altitude. There is 66% less oxygen in each breath on the summit of Everest than at sea level. Thin nylon ropes are used to keep climbers from falling. Climbers wear spikes on their boots called crampons. They also use ice axes to help stop a fall. Thick, puffy suits filled with goose feathers keep climbers warm. Most climbers eat a lot of rice and noodles for food. Almost all climbers use bottled oxygen because it is so high. It helps keep the climbers warm. Climbers start using bottled oxygen at 26,000 feet but it only makes a 3,000 foot difference in how they feel so at 27,000 feet, they feel like they are at 24,000 feet. Junko Tabei became the first woman to ascend the summit on May 16, 1975. Nawang Gombu is the first person to ascend Mount Everest twice. Babu Chiri Sherpa spent the night on the summit in 2003. The first attempt was in 1921 by a British expedition from the north (Tibet) side. The first summit team was a British expedition lead by Colonel John Hunt on the south (Nepal) side. The first summit was on May 29, 1953 by Sir Edmund Hillary from New Zealand and Tenzing Norgay, a Sherpa from Nepal. They climbed from the south side. The first north side summit was on May 25, 1960 by Nawang Gombu (Tibetan) and Chinese climbers Chu Yin-Hau and Wang Fu-zhou. The first climber to summit Everest without bottled oxygen was Italian Reinhold Messner in 1980. The oldest person to summit was Japanese Miura Yiuchiro, age 80 on May 23, 2013. The oldest woman to summit was Japanese Tamae Watanabe, age 73, in 2012 from the north. The youngest person to summit was American Jordan Romero, age 13, on May 23, 2010 from the north side. The youngest person to summit from the south side was Nepali Nima Chemji Sherpa on May 19, 2012. Apa Sherpa and Phurba Tashi both hold the record for most summits with 21, the most recent one in 2013. About 3,425 climbers have summited Everest once and another 2,220 have summited multiple times totaling 5,652 summits of Everest as of June 2011. 231 people have died trying to climb Everest. Almost all are still on the mountain. Over 33,000 feet of fixed rope is used each year to set the South Col route. You have to be at least 16 to climb Everest from the south side and 18 from the north. Climbers burn over 10,000 calories each day, double that on the summit climb. Climbers will lose 10 to 20 lbs during the expedition. It is one amongst the Seven Summits, the highest mountains of each of the seven continents, of the world.